Everyone has heard of the ‘paperless office’. 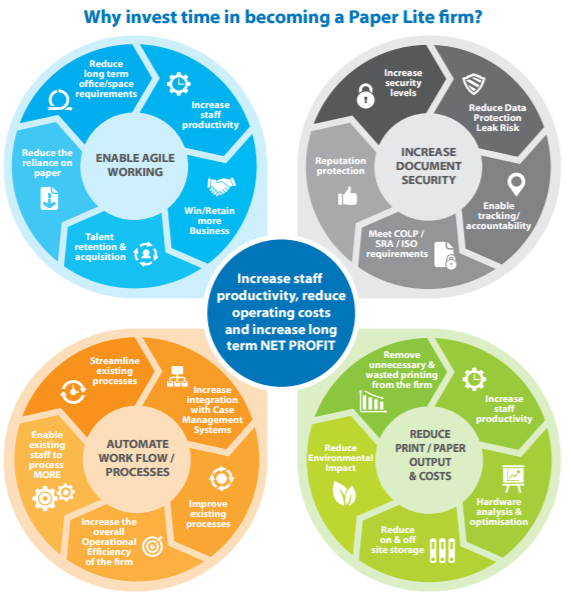 In some environments this can be achieved, but the reality is that even a ‘PAPER LITE’ environment will have a massive impact on the productivity and net profit of your firm. We’ve all heard of the latest Document Management software that will remove all of the paper within your firm… yet people are still working in document / paper intensive environments…. WHY? SIMPLE: This is because there is no MAGIC BUTTON, no software you can simply buy for X per month, install and then “Ta Dah”…all the paper disappears. A ‘PAPER LITE’ environment, where you are less reliant on paper and can process your workflow in a DIGITAL manner, is a TRANSITION like any other innovation within an industry / firm. small steps of continuous improvement…. In reality, innovation is a series of small steps that take place over time, which cumulatively leads up to changing the game. This is when you normally hear about it and think WOW… how did they do that? I wish we could be operating like that. Let me tell you, it wont of been from a magic button or some amazing software you’ve missed. It’s something far easier than that… it’s from a decision within the firm to START A JOURNEY. There is not a single piece of software or invoice you can pay to automatically make such a large leap for you, in ANY part of your firm. If there was, everyone would have done it already! The reality is far simpler than that and you don’t even need to put pressure on yourself for a timescale, as it won’t happen in a couple of weeks or months. This is because it doesn’t need a timescale IT JUST NEEDS TO HAPPEN FULL STOP. Take the EASY route… just DECIDE as a firm that you want to START THIS JOURNEY; Commit yourself with the Partners AND THE MOST IMPORTANT PEOPLE…The employees, who actually deliver the work EVERY DAY. This is a positive change which EVERYONE KNOWS should happen. It shouldn’t be used to REMOVE STAFF from the firm and it’s not an ‘AI’ revolution. It’s something which can prepare you for a positive push towards GROWTH. If you’re leaner and more productive you will be able to “EAT THROUGH” and process more billable hours (Sales Revenue)… with the same people that helped you get there. Announce that as a firm you are going to start this journey together and then engage with suppliers / partners and your employees to help you do this. It’s as easy as that. No timescale, just start the journey and make one initial win… the rest will follow. Unfortunately it won’t happen overnight – it’s better than that – it will happen in slow manageable steps which will improve the overall financial and operational efficiency of the firm. If you’re looking for an innovation that will improve your overall productivity and NET PROFIT… this is it! All you have to do is make it happen… no excuses! Alex Hutchinson is lead consultant at Efficient Law Firm. www.EfficientLawFirm.co.uk work with Small and Medium sized Law Firms, who do not have the luxury (or requirement) for a full-time technology / IT Director. If you are looking to make improvements within this area of your firm, but do not have the fixed internal resource to manage this project and deliver results, then let’s talk. If you want to increase your long-term profitability but don’t want to risk paying high day rate consultants for external advice… then let’s talk. Efficient Law Firm only generate a margin on results being delivered, ensuring a LOW RISK engagement for Clients. They are a DOCUMENT CONSULTANCY who help Law Firms transition from PAPER to DIGITAL and improve their operational efficiency and productivity of staff. Our focus = increasing clients’ productivity and NET PROFIT. Our Guarantee = No Salespeople and No Day Rates – fees only generated based on results / savings delivered. Previous post: Personal Injury Leads for Sale (UK)? Need to Buy PI Domain Names or Websites?